It’s not quite strawberry season yet, at least not around these parts, but there are times when I find myself food shopping and I can’t help but stare at the joyous, organic, red berries that constantly summon my attention with several winks and a price tag that reads “On SALE!” Sales are my weakness. And so are gorgeous-looking strawberries. Strawberries are possibly one of my most favorite fruit. Although they are available practically all-year-long in supermarkets and grocery stores across the country, when they’re not in season–usually–they’re practically good for nothing. They’re sometimes vile- both crunchy and sour, and lack in any strawberry flavor. Some will disagree about my last statement but I did say usually; there are a handful of companies that do have great tasting organic strawberries year-round. When I do find myself picking up a package or two of these glorious red berries that are lacking in the taste department, I most-often find myself baking them. 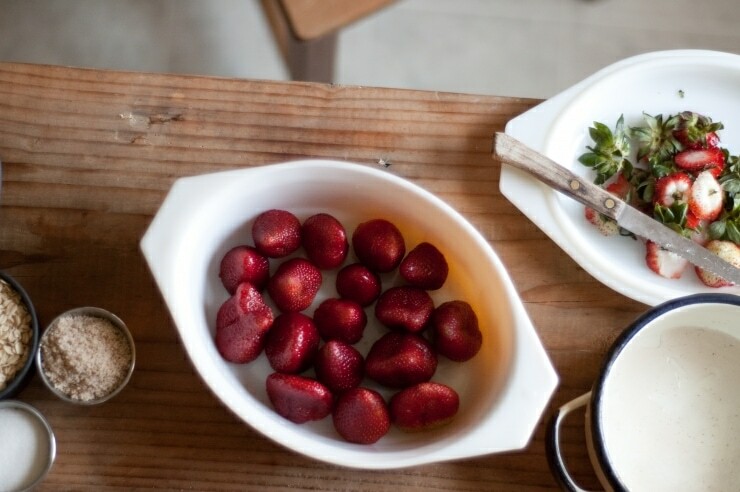 During strawberry season, rarely am I every interested in baking the marvelously sweet strawberries that I pick up from the farmers’ market– I’d much rather munch on them, toss them into a summery salad, or make jam to preserve their magnificent taste for when I need a burst of strawberry goodness during the dreary winter months. Although this crumble is made with abominable, store-brought strawberries, the berry flavors are enhanced as they bake under a blanket of ground almonds, oats, and a buttery crumble topping freckled with poppy seeds. You may think that the berries might turn out as mushy, red-tinged sludge, but they don’t. Instead, they are baked into succulent, strawberrily-intense explosions of flavor. When the crumble makes its way out of the oven, I try to amass all of my patience and let it cool on the counter for a few minutes before it makes its way onto the table, or into the refrigerator, where I let the flavors mingle for an hour or two. If my patience is nowhere to be found, I serve it straight out of the oven with a scoop or two of homemade vanilla gelato, and hope that the cool ice cream prevents mouth-burning. 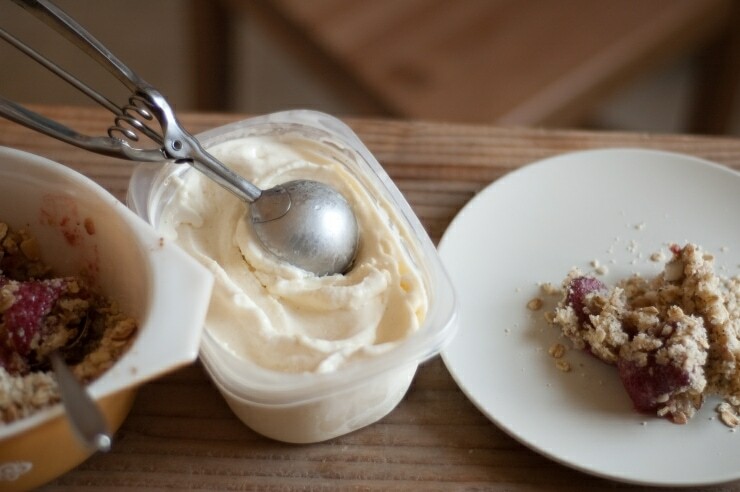 When there’s some leftover, I spoon the rustic crumble into Weck jars and keep them in the refrigerator for midnight-snacking. 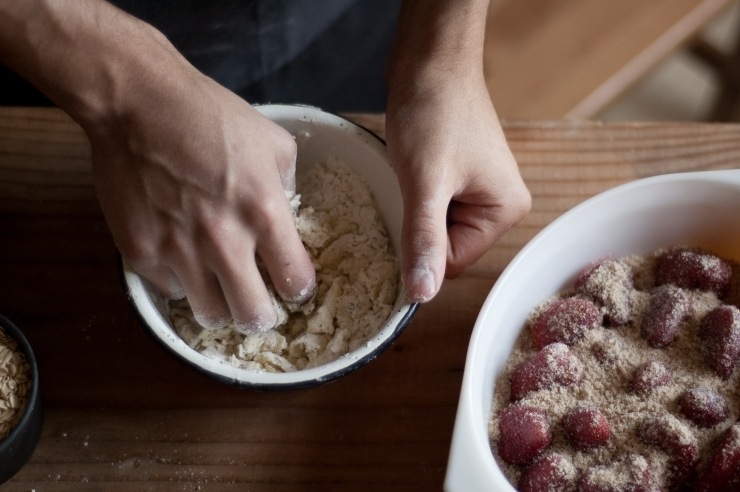 Oh, how I adore this crumble. If you are making this recipe at the peak of strawberry season, I’d cut down on the vanilla sugar by a lot, depending on how sweet the berries are on their own. If you don’t have any vanilla sugar on hand, use granulated sugar or natural cane sugar and a healthy splash (about 1 tablespoon) of vanilla extract when covering the strawberries in almond meal. Serving this with soft, billowy peaks of whipped cream, or a healthy scoop of vanilla ice cream is necessary when it’s served straight out of the oven. When served cool from the fridge, a glug of heavy (double) cream does the trick. 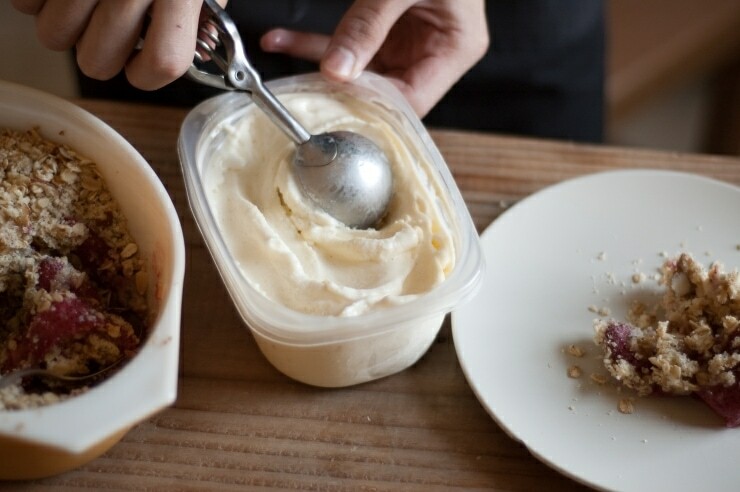 If you are lucky enough to have leftover crumble, spoon the remainder into small jars and place the jars in the refrigerator for midnight-snacking over the next couple of nights (if you can resist the urge to indulge). This recipe requires 1 ovenproof pie dish (or cake pan) approx. 8-in by 2-in deep (about 1 1/4 quarts capacity). For the photos in the post, I decided to use a vintage pyrex baking dish that snugly housed all of the strawberries; the baking time was still the same, so if you have the same dish, feel free to use it. Preheat oven to 400F / 200C / Gas 6. Place the hulled strawberries into your baking dish and sprinkle on the vanilla sugar and almond meal (I simply took ¼ cup of almonds and processed them in the food processor until they looked like sand). Give the dish a jiggle to mix the ingredients a bit. Place the flour, poppy seeds, baking powder, and salt, in a mixing bowl and rub the butter into the flour mixture with your finger tips, until the mixture resembles pale oatmeal. With a fork, stir in the rolled oats, sliced almonds, and turbinado sugar. Tip the Crumble topping over the strawberry filling, being sure to evenly cover the strawberries. Set the dish on a cookie sheet and bake for 30 minutes. When the crumble is ready, the topping will be a slight bronze color and will be blushing with pinkish-red juices at the edges. Serve warm or cold with generous scoops of vanilla ice cream, a heaping dollop of softly whipped cream, or a generous glug of cold heavy (double) cream. Enjoy! I would love this straight out of oven with big dollop of heavenly vanilla ice-cream! Ah! I can imagine that taste. Poppy seeds in this? new to me. Your preparation pics here are just lovely! where’s a cold shower when you need one? This looks and sounds fantastic! The photos are literally making my mouth water and I can just about smell the strawberry crumble from the description. You are making me drool all over my keyboard. Not too worry, it’s well worth the mess. It’s one of my fav fruit. I usually make crumble with other fruits but should try with strawberries. Love the pics! Helene – I love crumbles with just about anything, but strawberries are just so… mesmerizing. Mika- thanks! Have you tried roasted strawberries? They’re totally a religious experience! I caved and bought strawberries the other day also. I had to! I could smell them as soon as I walked into the supermarket…and that was the end of all my resolve. They were actually quite delicious. But maybe I’ve also just not had strawberries in so long that I was semi-delusional. Who knows. Next box is going into a crumble because this looks damn delicious! I am excited for strawberry season also. 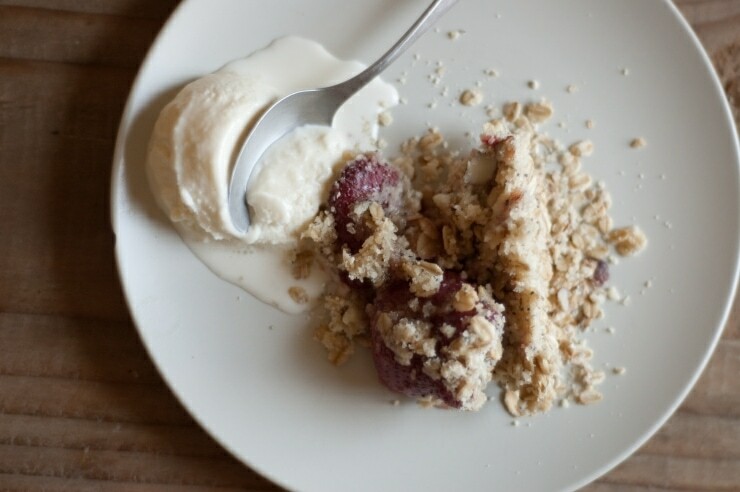 Your crumble looks fabulous!I a happy I found your blog! this looks divine! luckily, i live in florida, where it’s peak strawberry season right now. definitely need to make this soon! I just had strawberries for breakfast this morning, I know what you mean about how flirtacious they can be :). Great recipe for a treat! Roasted strawberries!? This sounds totally new to me…I googled it and the idea is fantastic!!! Do you have a trusty recipe, so I can use yours? I love strawberry ice-cream, strawberry jam and love to add them to my fruit smoothies! I love crumbles! Probably my favorite dessert. I personally love the combination of apples and raspberries in mine. Delish! This looks pretty amazing… I am saving this one for strawberry season. Lovely! Welcome, Cailin! So glad to be an inspiration to others our age! I found out about your blog recently and I have to say it’s awesome. Your recipes and pictures are so elegant yet simple. MMmmm…and we are just weeks away from perfectly delightful strawberries in their peak sweetness, can’t wait! Oh this crumble looks so yummy. I love the idea of having poppy seeds in the topping. Can’t wait to make it! Sounds yummy. Especially with the homemade vanilla gelatto. Is there a recipe for this please? Hi Kamran, ur blog was my exciting discovery of the week!, every food is described in such mouth watering details..can’t wait to try out the recipes. Heaven! Easy to make and cooking does something to not quite ripe strawberries, giving them a taste that’s out of this world. Fabulous straight out of the oven with lashings of double cream as advised by Nigella! Thanks for the inspiration! I used about 6 cups mixed strawberries and chopped peaches. For sweetener I put 2 tablespoons agave in with the fruit, then 1/4 cup demerara and 2 tablespoons agave in the topping. Oh, and since I am gluten-free I just used oat flour. It was fabulous… very well received at my book club last night. Thank you again! p.s. I was using partially frozen fruit so it took longer to bake. ottimo dolce veloce, che ispira anche i palati più prestigiosi. Can i make this without the ground almond?